Adaptive Insights provides a cloud corporate performance management (CPM) solution that automates collaborative planning, reporting, and analysis of both operational and financial data, and financial consolidation. With Adaptive Insights, you get a best-practice, active planning process to drive business success. It’s a great time to be a finance leader. Now more than ever, business leaders look to their finance colleagues to be activists—to provide active guidance, insight, and partnership to drive business results. According to CGMA, 71% of CFOs have seen their level of strategic influence increase over the past three years. And for dynamic industries and fast-paced organizations, the call for finance leadership is even stronger and is accelerating. Organizations increasingly rely on finance to understand and simplify complex business issues with data and objectivity; to understand the levers in the business model and set an appropriate measurement framework for the business; and to be storytelling prognosticators with comprehensive integrated business planning models. To do all this, finance needs to drive collaboration across functions, align the organization around an integrated business model, and then adapt rapidly as conditions change. Expectations for today’s finance leaders are high. To meet these expectations, finance leaders and their teams need to successfully negotiate their way through complexity and both plan and adapt with speed and agility. There are real challenges to meeting these rising expectations. Today’s finance teams are finding the need to drive business planning processes that are simultaneously collaborative, comprehensive and continuous. But because of limitations in their planning tools, they are forced to compromise. Finance teams compromise between getting the plan just right and just getting it done. Finance teams want full business partner participation in planning, budgeting, and forecasting, but compromise because it’s too hard to coordinate and manage so many stakeholders. They want comprehensive models driven by performance data, but compromise because it’s difficult to pull together the data and insights needed to build them. And, they want a continuous planning process with living plans, but compromise because it’s too hard to adapt the plan. These compromises are magnified in businesses that are fast-paced, highly distributed, or navigating a dynamic industry. In the end, such compromises result in a static planning process that falls short of meeting the needs of the modern finance leader. Static planning can deliver a plan that acts as a set of guideposts, but still falls short of driving the business. Static planning processes often lead to static plans, which lack buy-in, are inaccurate, and quickly fall out of date. And those plans can’t serve as the strategic, dynamic management tool finance leaders need to drive business success. So what will it take for finance live up to increasing expectations? Finance leaders need to evolve beyond static planning and develop a core competency in active planning. An active planning process is collaborative, comprehensive, and continuous—one that results in a better business plan and better budgeting and forecasting. Active planning provides greater visibility into business performance, builds confidence in the numbers, enables data-driven decisions, and increases buy-in and accountability throughout the organization. To adopt an active planning process, finance teams need a planning solution that is: easy-to-use, to enable a collaborative process; powerful to build comprehensive models based on KPIs and past business performance; and fast to enable the rapid adaptability required for a continuous planning process. You don’t have to compromise. Adaptive Insights provides the only corporate performance management solution that enables active planning—planning that is collaborative, comprehensive, and continuous. How do we deliver active planning? We offer a solution that’s easy, powerful, and fast. Easy. 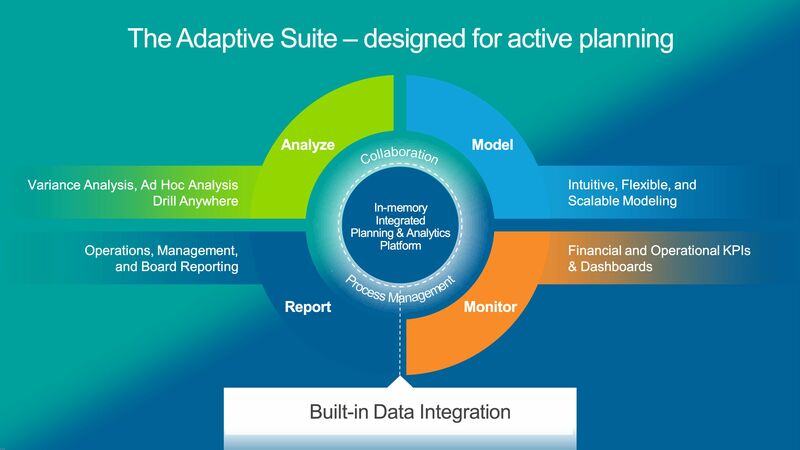 The Adaptive Insights solution, acclaimed for ease-of-use, is designed for both finance and business users, making collaboration among operations and finance professionals part of everyday planning and forecasting. True usability leads to greater adoption and results in better overall plans and forecasts and organization-wide visibility to KPIs and business results. Powerful. Adaptive Insights brings integrated planning and analysis, robust modeling, and flexible forecasting in a comprehensive, in-memory system—combined with a single source of truth. It’s a powerful planning, reporting and analysis tool that enables forward-looking and data-driven decision-making. Fast. The Adaptive Insights solution is built for faster time-to-value and agile planning–so finance can adapt plans quickly, spend more time reviewing the “why” behind the numbers, and support business partners with continuous planning. A core competency in active planning is key for today’s finance teams to live up to the higher expectations for business leadership. Active planning brings finance and business teams together in a collaborative and continuous planning and forecasting process based on comprehensive models and business performance metrics. Active planning brings the finance team more confidence in plans and forecasts, greater visibility to business performance across the organization, the ability to make dynamic, data-driven decisions, and a level of collaboration that provides organization-wide buy-in. With active planning enabled by Adaptive Insights, today’s finance teams can live up to higher expectations and successfully negotiate their way through complexity by planning and adapting with speed and agility.